Mat forming, tufted evergreen alpine with large rosettes of oblong to spoon-shaped, pale green leaves up to 12cm long. Large arching sprays of red-spotted, white flowers in late spring and early summer. 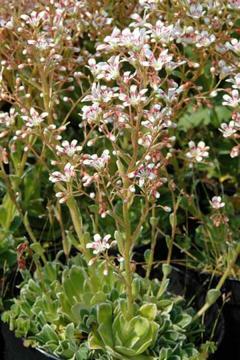 Similar to Saxifraga cotyledon. Very well drained alkaline to neutral soil in full sun or light shade in hot areas. Avoid excessive winter wet. Suitable for rock or scree gardens and alpine troughs.